Have a game plan. Before you go, talk to your family about what to do if someone gets lost: Stay put, or find a park worker or another mom with kids. Bring a Family Photo. (or TAT TIP take one with your cell phone the day of your trip!) This will make it easier for park security to locate your child. Take digital snaps of each of your kids right before you leave so you can show what they’re wearing. Tattoo Your Child. That’s us! If your kids are too young to memorize your cell-phone number, mark it on them. One neat idea is personalized temporary tattoos that have your number right in the design (safetytat.com). Check the Map First. Start the day off by locating the park’s information centers in advance so you can point them out to your children or get to them quickly in case of an emergency. Also, look for the first-aid and baby-care centers. TO SHARPIE OR NOT TO SHARPIE? We say “no, thanks” to that. Choose identification your child won’t lose. If you are using our Quick Stick Write-On! SafetyTat, the marker provided is waterproof (so it won’t smear or fade) and non-toxic, but not appropriate for writing directly on skin. The Quick Stick Write-On! provides a complete barrier between the marker and your child’s skin. Research from The Center to Prevent Lost Children now owned by SafetyTat LLC. May not be reproduced or copied without permission. According to a 2005 report, the U.S. Department of Justice estimated that approximately 340,000 children a year become temporarily separated from a parent or a caregiver for at least an hour.And those numbers reflect only reported incidents, and not the thousands of times parents have lost a child for a few excruciating minutes. Thankfully, most children are found quickly, often even before they realize they’re lost. And possibly every parent’s worst fear — abduction by a stranger or an acquaintance — is very rare: Only 115 meet the criteria for this type of kidnapping a year. TatTip: We tell our children if they are lost, ask a MOMMY for help. Many parents struggle between giving their children freedom and providing them protection. Freedom offers children time to explore, learn, run (and fall), succeed (and fail). Freedom offers opportunities to learn, albeit sometimes “the hard way”. Where do we draw the line? While we cannot protect our children from every mishap, what we can do is prepare them. 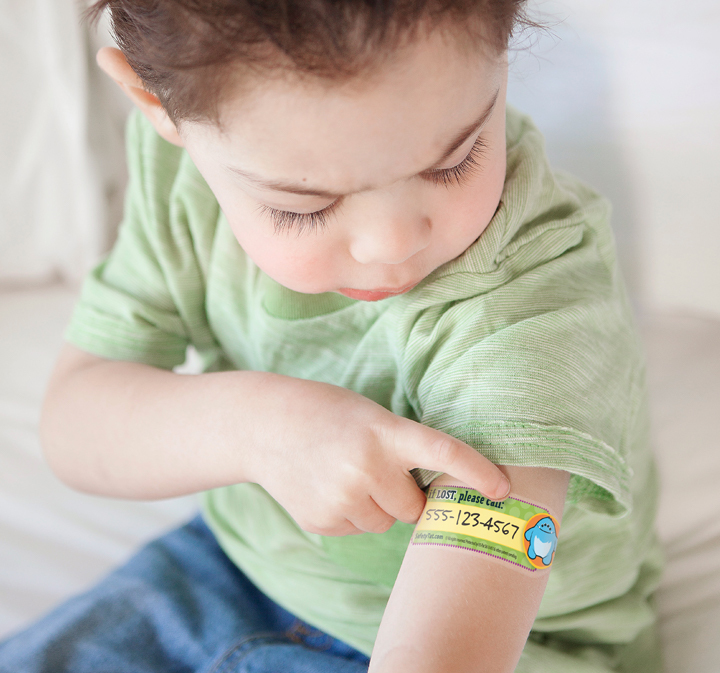 We already knew that parents love the peace of mind SafetyTat provides and kids love the cute SafetyTat designs. We learned something very important: when wearing SafetyTat, many children do not panic when separated from parents. They feel EMPOWERED. They are calm, know exactly what to do and understand that the simple tattoo on their arm is a way to get back to his/her parents fast. Having a plan helps to set your children’s expectations and allows them the confidence that they know just what to do in a given situation. If you calmly talk to your children about “what to do if…” They will not be fearful. They will simply take charge.